100 oz Hydration Bladder  - $20.46 : Advantage Supplies, Inc. 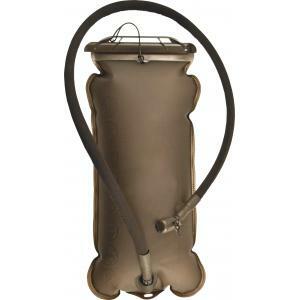 This Hydration Bladder is designed keeping the heightened abuse that may arrise in extreme situations in mind. The bladder is sealed with a slider top lock which opens wide across the entire top of the bladder. This makes it ideal for easy filling, cleaning, or adding ice to. It is made of 4mm thick thermopolyurethane (TPU) which is twice the thickness of ordinary bladders. It comes with a big bore tube that is lightweight and has the insulation applied to the tube rather than covered with a sleeve. The end of the tube is equipped with a surge valve and a protective cover.